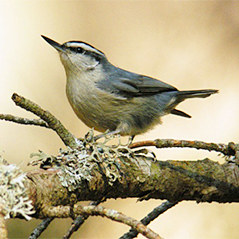 Corsica has two endemics, Corsican Nuthatch and Corsican Finch. Additionally, four recently-split species, Marmora’s and Moltoni’s Warblers, Italian Sparrow, and Tyrrhenian Flycatcher can also be found on the island. The introduced California Quail still hangs on in coastal areas where a seawatch should produce Levantine and Scopoli’s Shearwaters. Day 1 Afternoon flight from London Heathrow via Nice to Bastia where we will spend the night close to the airport. Day 2 We will make an early start and head into the mountains to look for our first target bird, Corsican Nuthatch. Although it is not a large island it is very mountainous so the journey will be slow. As will not have far to travel hopefully we will soon be watching this delightful little bird foraging and possibly feeding young in the endemic Corsican Pines. While Corsican Nuthatches are very selective about their habitat the other endemic species, Corsican Finch, is more widespread. Unlike its cousin, Citril Finch, which is found above the tree-line in the mountains of mainland Europe, Corsican Finch occurs in a wide variety of habitats. We will spend the whole day in the mountains seeking out these two endemics and will almost certainly also encounter the highly-localised Marmora’s Warbler. Since Balearic Warbler was split from Marmora’s Warbler, Corsica has proved to be the easiest place to see the latter. Other birds we may encounter include Red Kite, Common Buzzard, Blue Rock-thrush, Yellow-billed Chough and Cirl Bunting. Late afternoon we will check into our hotel in Zonza for a four-night stay. Days 3–4 These two days will be spent leisurely exploring the mountains and forests where in addition to the species listed the previous day, we will look for the recently split Moltoni’s (from Subalpine) Warbler. The other newly-split species present on the island are Tyrhennian Flycatcher and Italian Sparrow which are both relatively common throughout the island. Day 5 Today we will head down to the east coast where we will explore several habitats ranging from vineyards to coastal scrub and lagoons. Birds we may encounter during the day include Purple Heron, Western Marsh-harrier, Zitting Cisticola and Dartford, Melodious and Sardinian Warblers. Additionally we should find Common Firecrest, Spotless Starling, Hooded Crow, Spanish Sparrow, Rock Sparrow and European Serin. One of the special birds of the area is the introduced California Quail. Although well-established, nowhere is it common so we will hope to have luck on our side. In the afternoon we will visit a headland to do some seawatching. Audouin’s and Yellow-legged Gulls should be present and we will see more Scopoli's and Levantine Shearwaters as well as the Mediterranean race of European Shag. Around the cliffs, Alpine and Pallid Swifts and Eurasian Crag-martin can be found. In the evening we will visit several local sites to listen for Eurasian Scops-owl and, hopefully, to see one. Day 6 After checking out of our hotel, we will spend the day travelling north back through the mountains to Bastia for a last look at the endemics before to catching our late afternoon flight back to London. General Information The pace of the tour is moderate with only a reasonable degree of fitness required as walks will be just 2–3 miles each day. Whilst much warmer around the coast, the temperature can be cold in the mountains early morning and at this time of year rain is also possible so appropriate clothing and footwear is suggested. Visas are not required for EU citizens. Group Size Minimum number for tour to go ahead: 6 with 1 leader, maximum 12 with 2 leaders. Price includes economy scheduled flights between London and Bastia, accommodation in twin-bedded en-suite rooms in medium-standard hotels, ground transport by minibus, all food from dinner on day 1 to lunch on day 6 and services of the leaders throughout. Excluded are drinks, gratuities, insurance and items of a purely personal nature.